Panorama of Toze Kangri and Pur Co. The Toze Kangri range is a smaller mountain range in western Chang Tang a bit south of the main Kun Lun range. It rises about 1100 meters above the high plateau. The mountain range extends about 20 km in its N-S direction and 12 km in W-E direction. It is covered by a large glacier with an area of about 200 square kilometers. The glacier covers most of the peaks in the Toze Kangri range, among the the two almost equally high main peaks: Toze Kangri SW and Toze Kangri NE. Exact altitudes of the two main summits have not yet been determined and numbers in maps show strong variation. Although several other expeditions had been within the sight of Toze Kangri in the past years, the mountain remained unclimbed. Biggest challenge actually lies in the logistics of covering over 200 km distance of roadless environment before even climbing can start. Especially in the water saturated soils of the Chang Tang plateau make an approach very tricky. In fact, it remains a small time window in fall, when soils are already frozen but winter has not yet arrived. 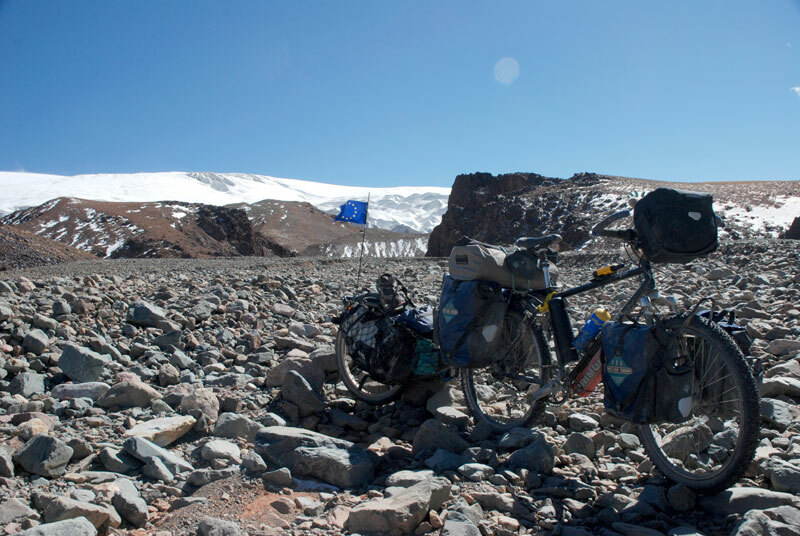 Intrigued by the possibility of achieving a first ascent on a 6000m+ mountain, Toze Kangri became the primary goal of the 'Mountain & Bike' expedition. On the way to the Toze Kangri Glacier through a dry river bed. 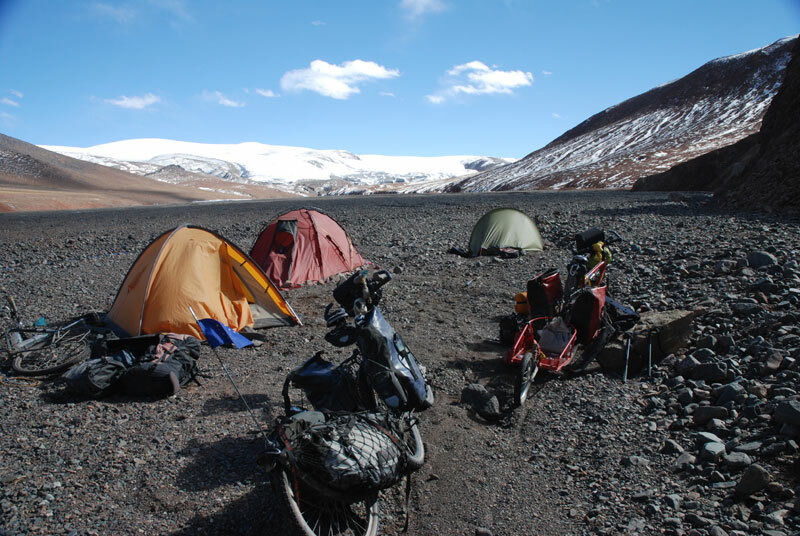 Base camp at 5340 m in the river bed. Difficult to find water. 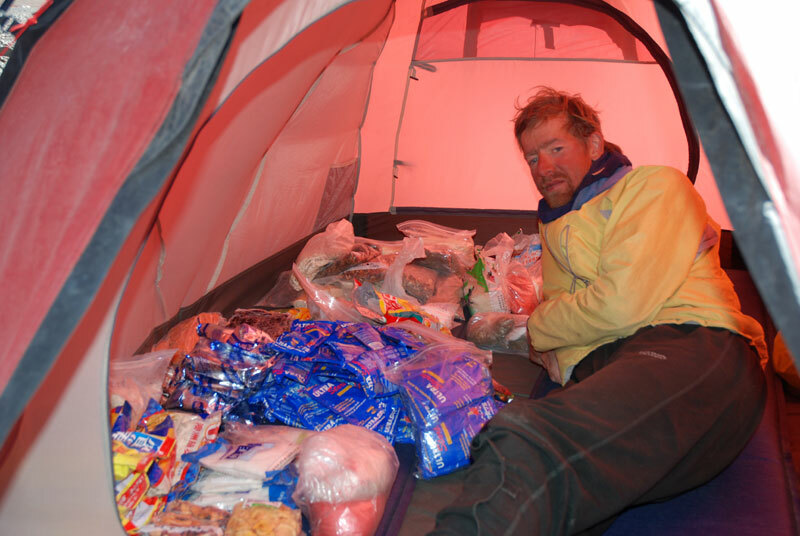 Enough food is there to wait for optimal climbing conditions. Bikes were pushed about 6 km on the gravel bed of the river to the foot of the glacier. We wanted to put base camp as close to the glacier as possible to have shortest ways for ascents. It was actually quite challenging to find water in this dry river bed, as there was no melting run-off from the glacier.